Every now and then I search through my makeup stash, there's always that one shade that stands out to me and that is Illamasqua's Whack. Now that it's starting to get a little warmer I thought it would be the perfect time to break out the most luminous orange I could find. I find that Illamasqua polishes don't get much coverage despite their amazing quality. I suppose the price point is one of the downsides (possibly the only one) but there's always regular sales going on to make the spending a little less daunting. 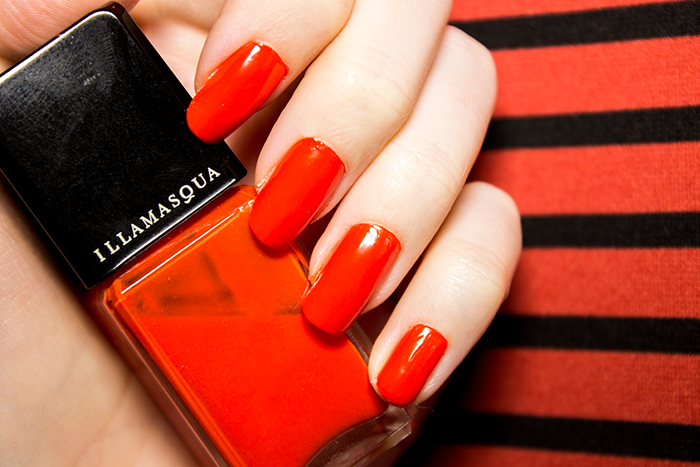 Whack is a bright reddish/orange shade with a glossy finish. I find it has the right consistency for application where it's very easy to apply and blend out yet not too thick where you'll be spending hours waiting for it to dry. As for staying power, this polish lasts a good few 4-5 days before showing any signs of wear and tear. If high end polishes are your thing, give this shade a go!